Papercraft, also known as paper modeling or card modeling, is a fun and fulfilling hobby for kids and adults. 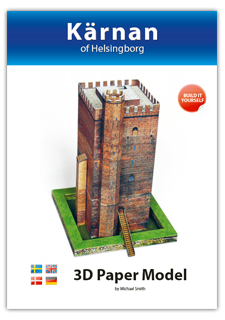 Kärnan of Helsingborg is a paper-model book which contains thick, durable pages that you can cut out and glue together to construct your own 3D paper model of Kärnan in Helsingborg, Sweden. The book also contains historical information about the tower and instructions in Swedish, English, German and Danish. You can see excerpts from the book here. The paper model was painstakingly designed using over 1,000 real photos of Kärnan. Great care and much time was taken to ensure that each row of bricks was properly aligned and adjusted to present the highest level of detail and realism. The finished model is 1/160 scale (N Scale), about 23 cm tall, and has two levels of detail (LOD), which means it has optional parts that make it more challenging and add more detail for experienced users.